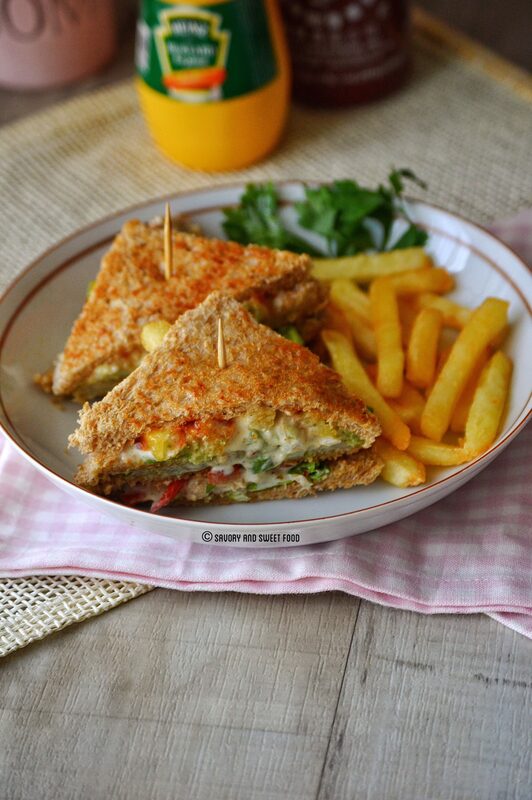 A sandwich of toasted bread, sliced crumb fried chicken, crisp lettuce, avocado, tomato, cheese, fries and a delicious honey mustard sauce. I love sandwiches, my husband loves it, my whole family loves sandwiches. I really enjoy making it too. Its mainly just about piling delicious things onto fresh toasted bread. It’s no rocket science. But you do have to do a little thinking to use the perfect combination of ingredients to get the ultimate sandwich. My sister, hands down, makes the best sandwiches in the world. Hopefully she will start her own cafe someday, which is her dream by the way, and I will announce it here and you all will have to try out her yummy creations. It’s just too good. I get a lot of ideas from her. 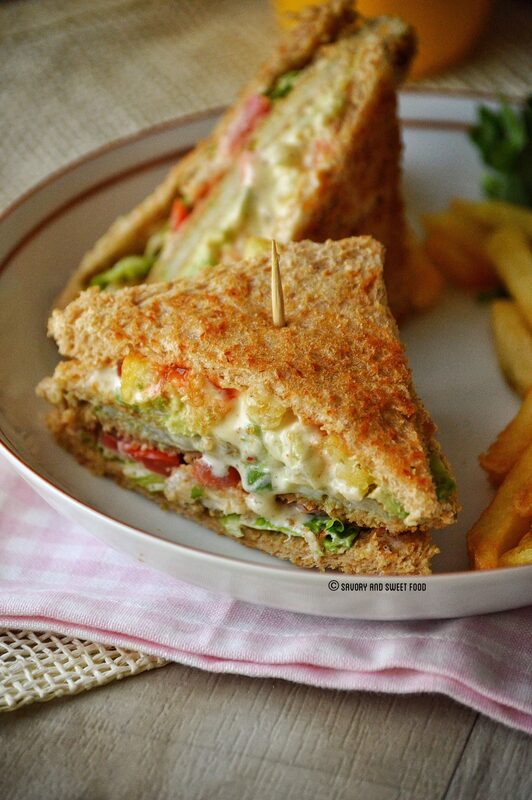 This chicken club sandwich is one of my new favorites. It is loaded with everything a perfect sandwich should have and it feels like a total treat. The honey mustard sauce made the sandwich taste really yummy . This sauce is my husbands all time favorite. Honey and mustard really makes a classic combination. 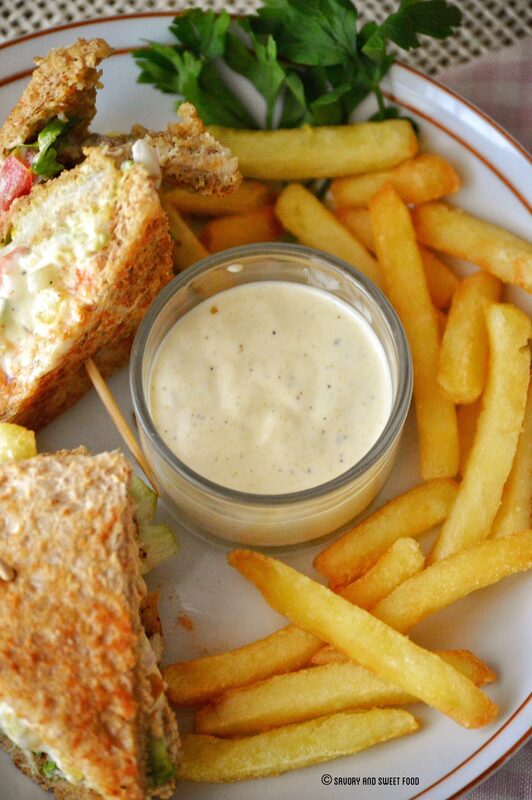 You can use it as a dipping sauce for chicken fingers, french fries, pretzels, you name it. With few adjustments you can use it as a salad dressing too. 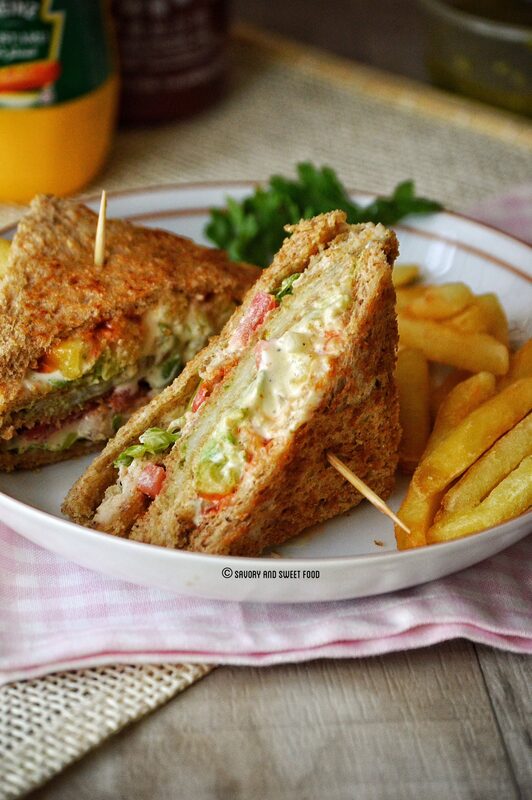 So here is the recipe of chicken club sandwich for you all. 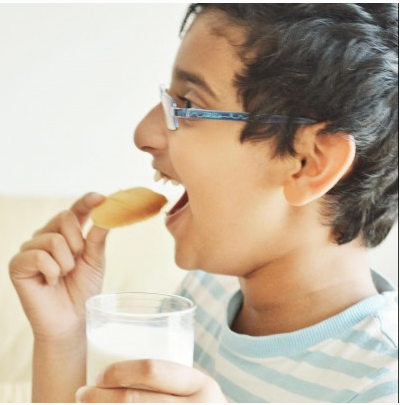 Hope you guys will give this simple recipe a try. I think you’ll love it! You can add any filling you like. Pound the chicken to make it thinner. Mix all the ingredients for spice mix in a bowl. Sprinkle this spice mix onto the chicken on both sides. Keep for half an hour or more. In another bowl, mix together the bread crumbs, paprika, garlic powder and salt. Now dip the seasoned chicken breast into the beaten egg and then into breadcrumbs. Press to coat the chicken well with the crumbs. 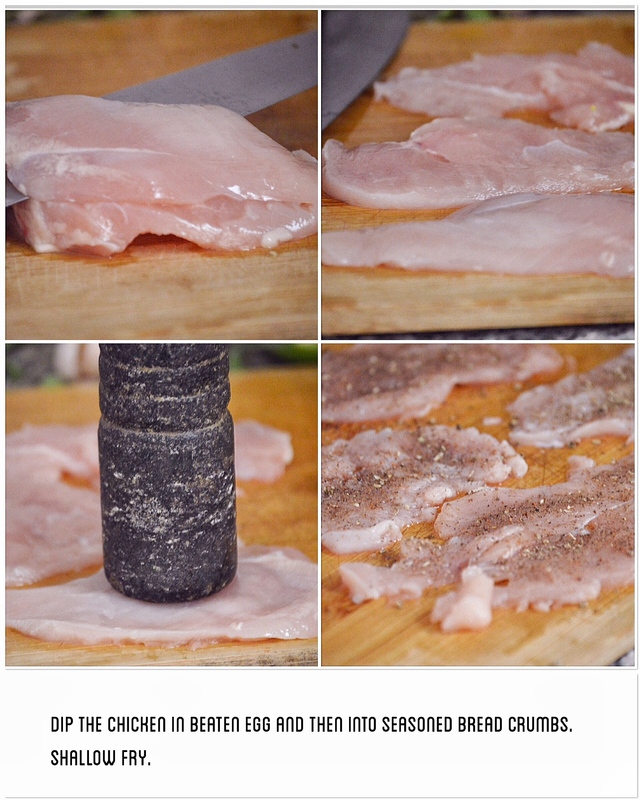 Cut the chicken into slices and keep it aside. Mix together all the ingredients for it in a bowl. Add more honey if you want your sauce to be more sweeter. Trim the sides of the bread. For one sandwich you will need four slices of bread. Toast 2 slices of bread in little butter till the exterior gets crispy and golden brown in color. 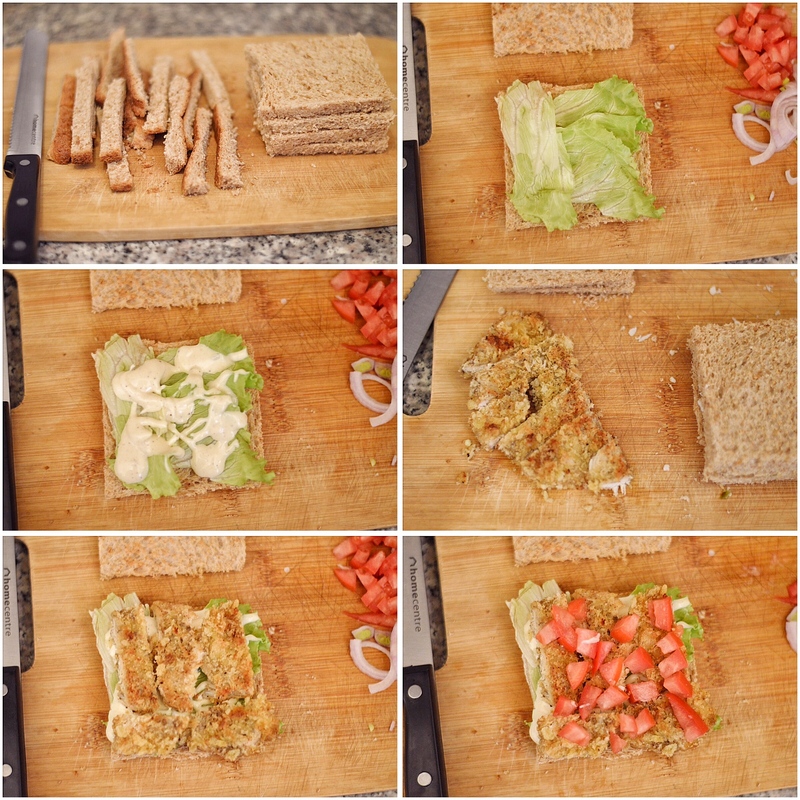 Take one slice of bread, keep lettuce on top. Pour the honey mustard sauce. Place the sliced chicken pieces. Take the two untoasted slices of bread. On one slice spread the jalapeño paste. on the other slice add mozzarella cheese. Place the jalapeño spread bread slice on top of the mozzarella slice. Press the sandwich with your hand. Toast this in a little butter till the the cheese melts and the slices get crispy. 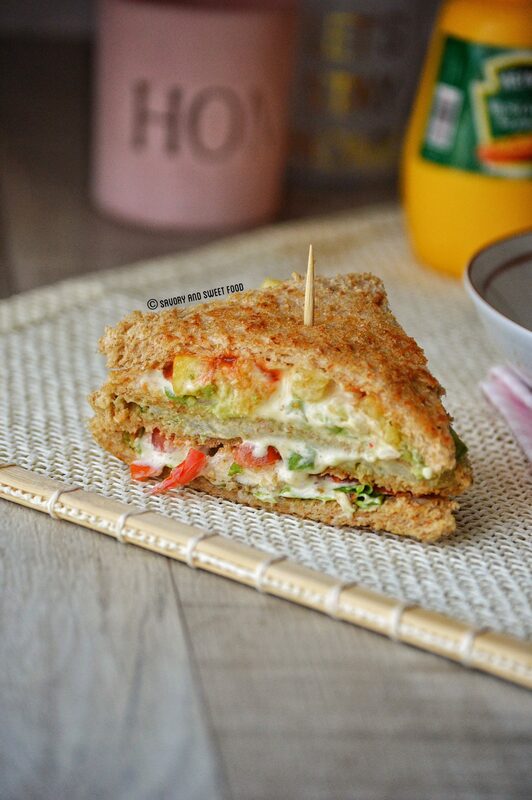 Place this sandwich on top of the tomatoes (of the previously arranged slice). Spread the honey mustard sauce over it. Add avocados, onions, french fries, more honey mustard sauce and finally sweet chili sauce. 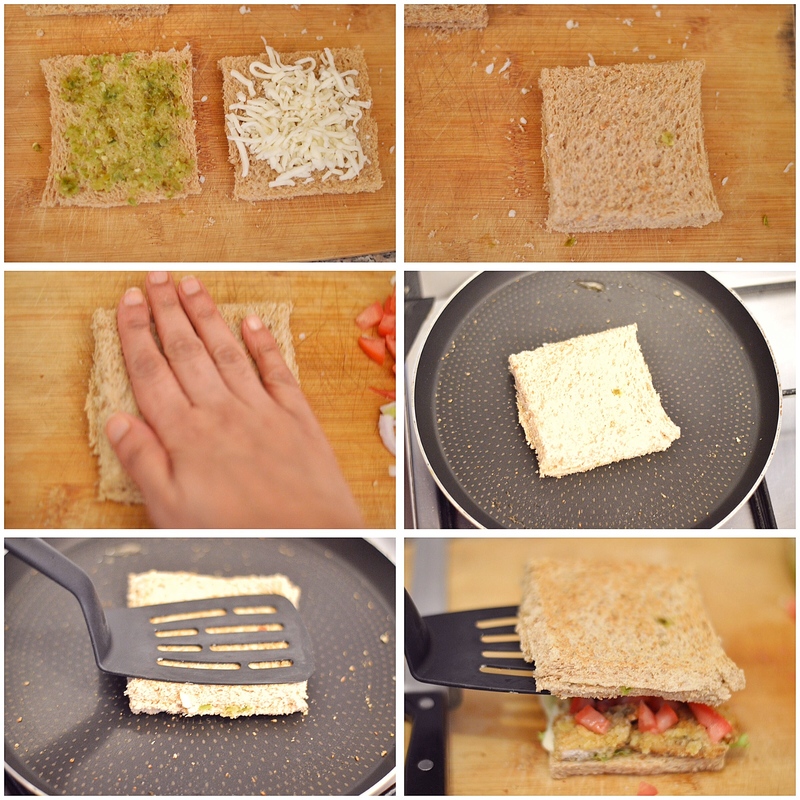 Place the fourth slice of toasted bread on top of all this to close the sandwich. Press well with your hand. 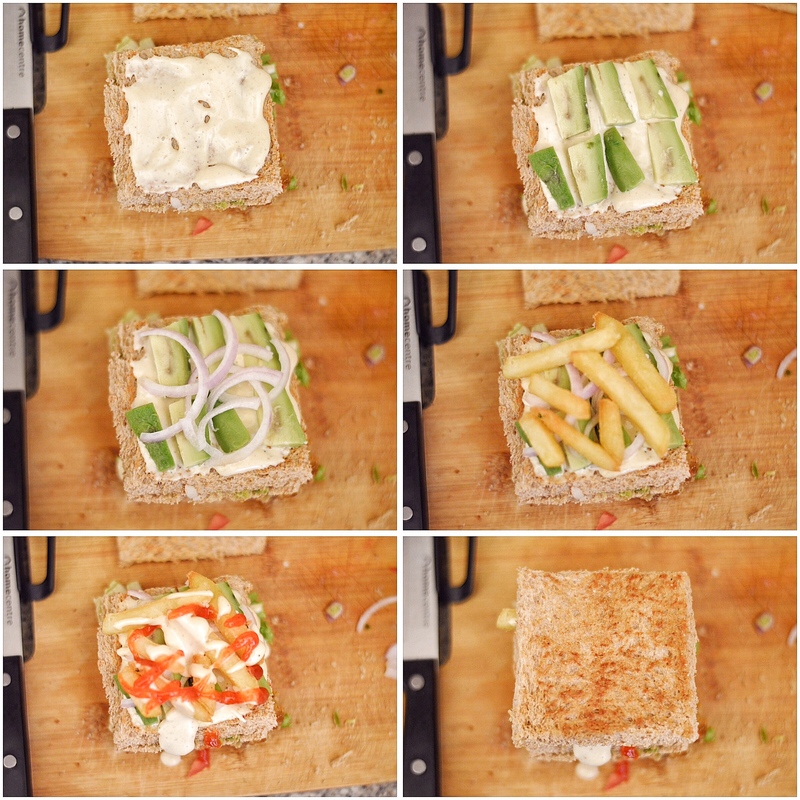 Cut the sandwich into half and serve immediately. Thank you nimmi! Yes I had a great vacation. YUM! Now this is a club sandwich if I’ve ever seen one. Seriously, sammie perfection. Thank you so much Karly. Sounds delish but how do you make jalapeño paste? Thank you! I’m going to give it a try!